Summary: A survey of 43 great American writers and their adventures with the bottle. Each writer has a two page spread which includes a quote about drinking, an alcoholic anecdote, an authentic cocktail recipe, and a sample of his or her writing which deals with (you guessed it!) booze. Remember all those boring canonical works we’ve read over the years? With motifs and metaphors and *shudder* symbols? Of course you do! Imagine how much more interesting these stories would have seemed if we had known that most of the writers were actually party animals. Like, fall down drunks. So in honor of Saint Patrick’s Day (and for those perennial lovers of literature and liquor), I’m reviewing this little gem of a book. The layout is perfect, and Hemingway and Bailey were very wise to not be overly ambitious. Not to say this book is lacking ambition – it just knows what it wants to be. Two small pages with these perfect bites (or should I say shots?) of information, without getting too unwieldy. There is no moralizing or explanations for the drinking, which is nice. It’s light and fun, perfect for a complete read through or to be used as an interesting cocktail guide. Another of my favorite stories involves John Steinbeck, who has written some of my favorite pieces of literature. I always think of him as Mr. Serious About Labor and the Rights of Humanity Steinbeck. Mr. I Wrote The Pearl Which is the Most Boring Novella in the History of Novellas. I have read a lot of his work, and I never imagined his life like this. He lived in Hollywood, and he and his friends invented a game to test their capacity for alcohol. They’d place empty wine bottles on the bottom of the pool. You’d have to dive in to get the bottles, and if you drowned – well you were too drunk! Seriously. I kind of wish Tom Joad got to play that game in The Grapes of Wrath, the poor dude never got to have any fun. The quotes are also really fantastic. Some deal with the nature of drinking itself (“First you take a drink, then the drink takes a drink, then the drink takes you” by F. Scott Fitzgerald); others about the number of drinks (“I drink exactly as much as I want, and one drink more” by H.L. Mencken), and some are about the side effects that make good stories (“One drink more and I’d have been under the host,” the incorrigible Dorothy Parker). But my favorite comes from Robert Benchley, “Drinking makes such fools of people, and people are such fools to begin with, that it’s compounding a felony.” It so perfectly describes the nature of humanity, and the nature of a drinking humanity. Another thing I appreciated was the breadth of writers represented in this book. There are the obvious – Hemingway (the illustrator’s grandfather), Faulkner, Parker, Poe. But then there are more obscure authors, like Hart Crane or Dawn Powell. This book can work as a nice introduction to the American canon, as most of our important writers seemed to have been drunks. Did I mention the drinks? 43 cocktail recipes, ranging from the Long Island Iced Tea to a Sidecar to a French 75, a drink named after a gun popular during the World Wars. This could also be a handy-dandy reference book too. Ever read a short story and not know the drink of which the protagonist is partaking? I bet it’s in here! I’ve tried a few of the easier ones (as I’m lazy and not a good mixologist), and they turned out well. It makes me feel closer to my literary heroes, as I drink their favorite mixes and type away at my keyboard. This book is begging to be a literary party center piece – have yours friends dress up in ’20s garb and serve drinks from the same time period. Voilà! You have an Algonquin Round Table party! -Literature and liquor, need I say more? -Lacking in substance, which hey – it’s a cocktail guide. Not gonna be a revelation. 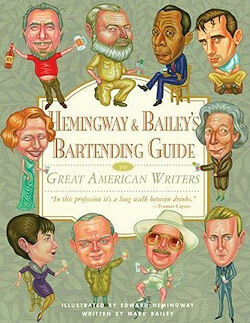 Hemingway & Bailey’s Bartending Guide to Great American Writers is a wonderful book. The stories are often hilarious, and have given me many devious ideas. It’s also an aspiration – I hope I will be one day mentioned in a future edition of this guide! Dreaming big. But the most effective part is that it brings the writers to life in a way that makes them real people, instead of the name under the title of that boring book we had to read in high school. Pick up a copy or give it as a gift (as my good friend Anastasia gave me mine!) for any fan of great writers, great drinks, or both. Happy Saint Patrick’s Day, everyone! No drunk diving in Steinbeck’s pool! I too need alcohol when I read anything by Henry James. Way to go Cheever! This book sounds pretty hilarious. Are the authors’ names REALLY Hemingway and Bailey, or was that for added effect? Lol. YAY! The minute I saw this book I thought of you. I can’t wait to open the next drunk authors book and see a picture of you enjoying anything with Dr. Bushmills in it! lol …You might be classier at that point though…I hope not.